The night belonged to Anderson Feliz despite a strong comeback effort by the Blue Crabs in the ninth inning. 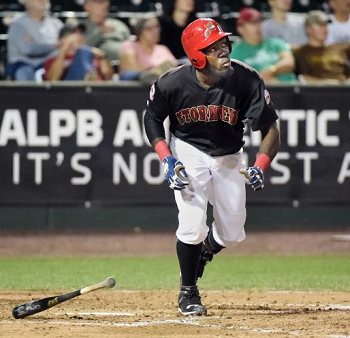 Lancaster’s third baseman homered, doubled twice and drove in five runs to lead the Barnstormers to a 6-5 victory over the Southern Maryland Blue Crabs to even the best-of-five Freedom Division Series at one game apiece. Feliz, who had not delivered a long ball since August 15, took Brian Burres (0-1) over the picnic wall in right field for a three-run blast in the fourth and a 4-1 Lancaster advantage. The switch hitter doubled off Burres in the sixth but was stranded at second base. Then, in the eighth, Brian Cavazos-Galvez reached on a single to the hole at shortstop and moved up when Luke Hughes was hit by a pitch. Feliz, batting left-handed against Justin Berg, sliced a double into the left field corner, plating both runners for a 6-2 advantage. It turned out the Barnstormers needed the cushion. They had to fend off a huge Southern Maryland rally in the top of the ninth. Jamar Walton led off with a single to left off Marcus Walden. Keith Castillo hit a grounder to the right of Tyler Bortnick. The second baseman moved into position to begin a rally killing double play, but the ball took a crazy bounce over Bortnick’s head into right center, putting runners at first and third. Blue Crabs skipper Stan Cliburn went to his bench for three straight pinch hitters. Jake Opitz drilled a double into left center to score one and bring the tying run to the plate. Craig Maddox hit a high hopper back to the mound, and Walden pinned Castillo in a rundown for the first out, with the other runners ending up back at second and third. Fred Lewis singled into left, knocking home Opitz and driving Walden out of the game. Casey Stevenson reached Scott Gracey for an RBI single through the right side to cut the lead to 6-5. With the tying run at second and the lead run at first, Zach Wilson went down in the count, 0-1, before rolling a grounder to short. Lance Zawadzki flipped to Bortnick, who made the strong throw back to a fully stretched Mike McDade to complete the double play and hold the win. Nate Reed (1-0) pitched six solid innings for the Barnstormers, allowing six hits and two runs, to record the win. Bortnick was 3-for-3 with a walk in the winning effort. The series shifts to Regency Furniture Stadium in Charles County, MD for the remainder. Joe Gardner (9-6, reg. season) will make the start for Lancaster against right-hander Jon Leicester in Game Three on Friday night. Fans may tune into 1390-AM, WLAN; rumba1390.com or the I Heart Radio cell phone app, beginning at 6:45.